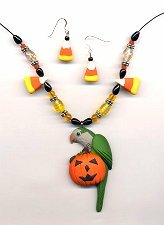 Each custom necklace is made up of beautiful glass beads and metal spacer beads on either side of a custom handsculpted parrot, who is perched on a Halloween Pumpkin, and hangs on a black cord. 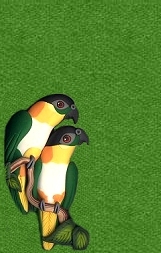 The bird will be created to match your own favorite feathered friend. 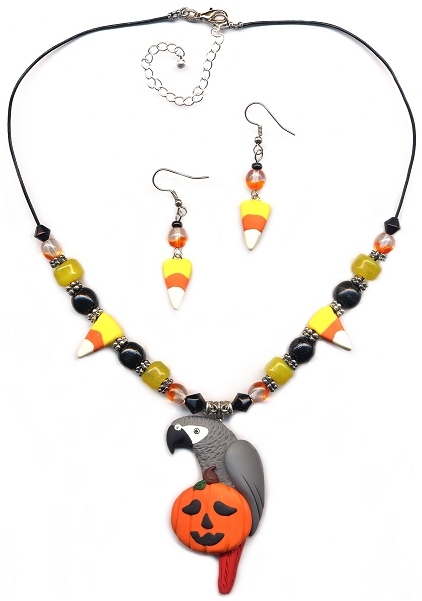 Handsculpted polymer clay "candy corn" beads adorn the necklace and matching earrings. Exact glass beads will vary, but will be hand picked to match perfectly in the same colors as shown, ensuring that your necklace is truly one of a kind! Necklace cord length will be made to your choice, with an optional 3 inch chain extender, and finished with a lobster clasp. Optional glossy finish available for $5.00 for the set. Available in all species! Click on photos below for selection & prices.